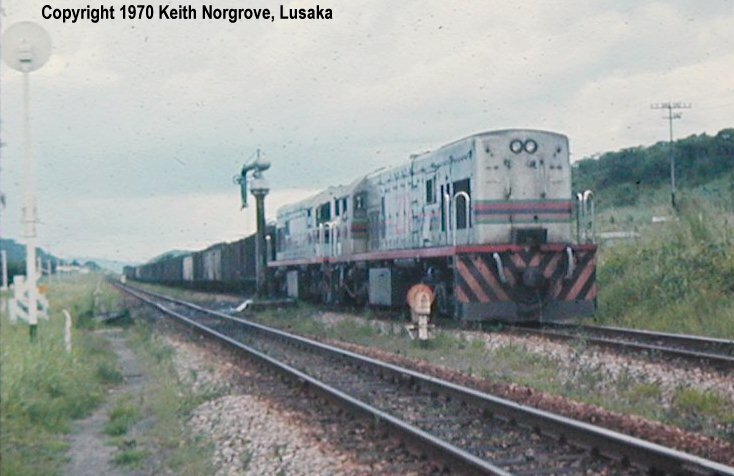 This page is intended to document my project to model one of the U20C engines that were the mainstay of Zambia Railways when I worked on the line in the 70s and 80s. 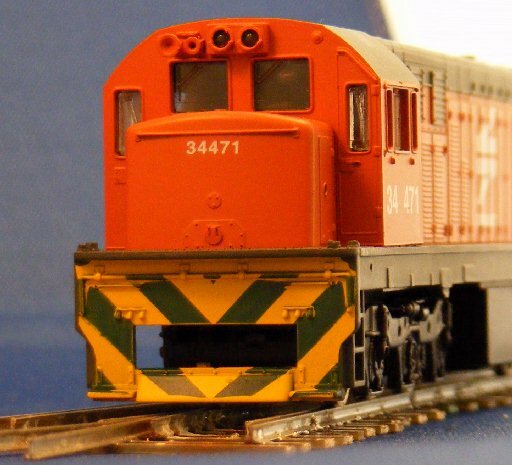 The project is going to show conversion of a Frateschi model of a South African U20C from 00 to the correct 14mm track gauge, although sold as H0 these locos are actually to 4mm scale. To lay the ground I'll start with some pictures of the real thing to show the intent. The official diagrams are here, click on the image to get a high resolution version if you want to print them. 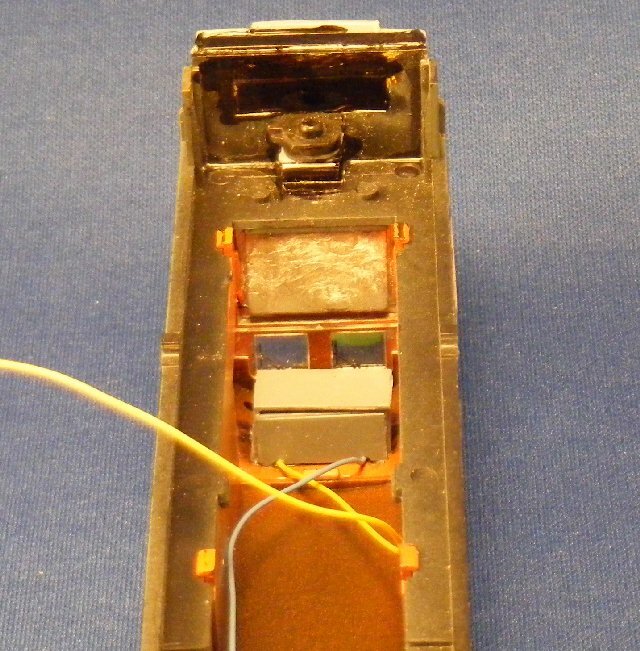 The U20 diagram is the long nose version , to get the short nose version you need to take the relevant bits from the U15 diagram. 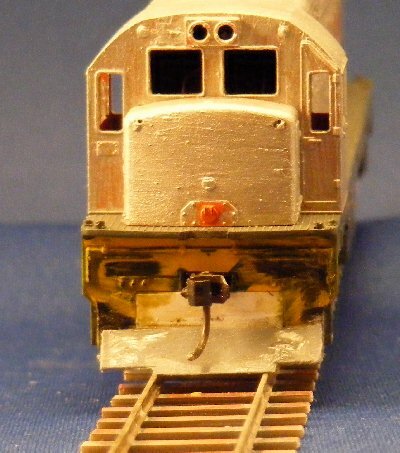 OK Now its time to start in on the model, first a couple of pics more or less out of the box. 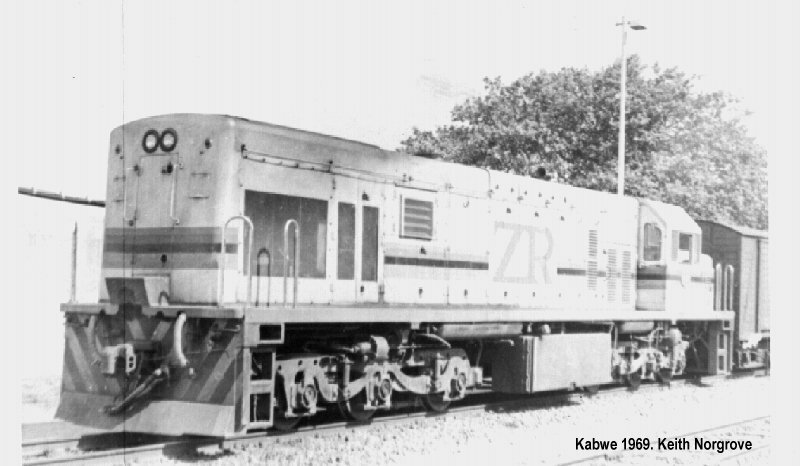 Actually I had removed a couple of wheelsets and turned one pair of wheels to size as will be shown below. 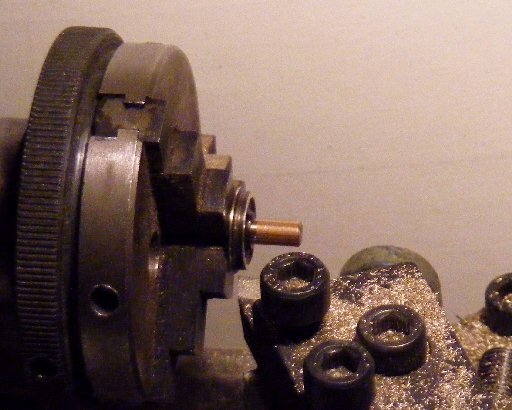 This whole project hinges on the ability to convert the wheelsets to 14mm gauge and finescale so the first task was to dismantle enough to get a couple of wheels out and onto the lathe. 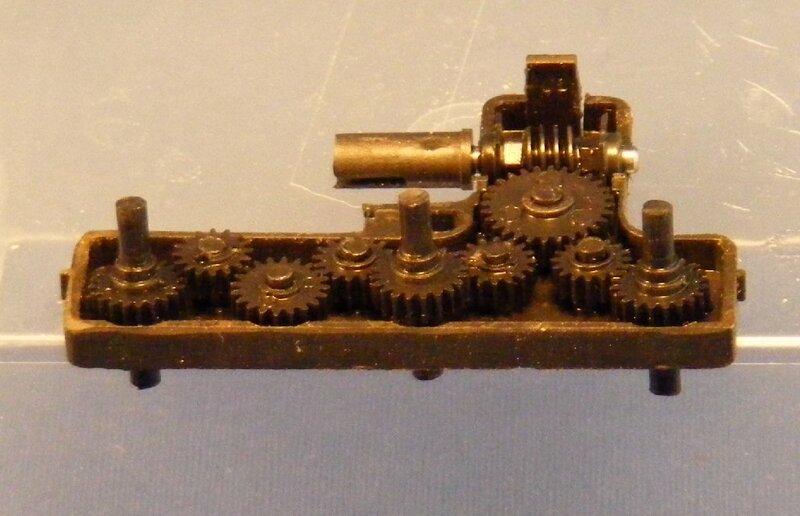 The chassis has a drive shaft missing as I just replaced the bogie with missing wheels to take the photos above. 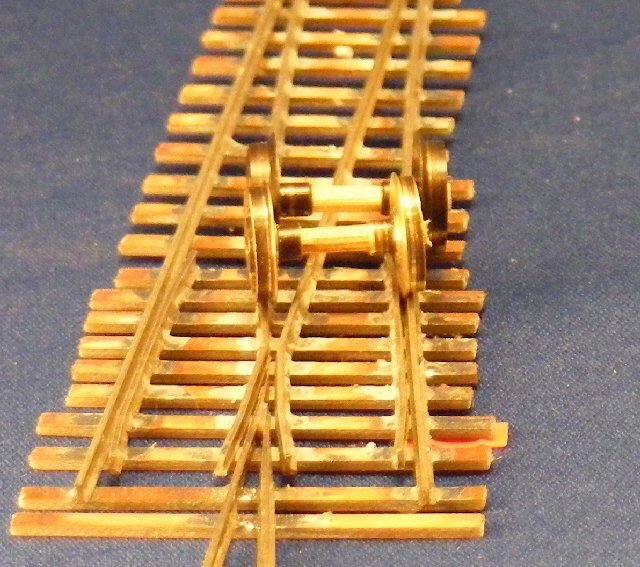 The first pair of turned wheels are pushed onto a temporary wooden axle for these comparison shots. (I don't want to re-assemble them onto the plastic geared axles until final assembly to avoid the wheels becoming loose). 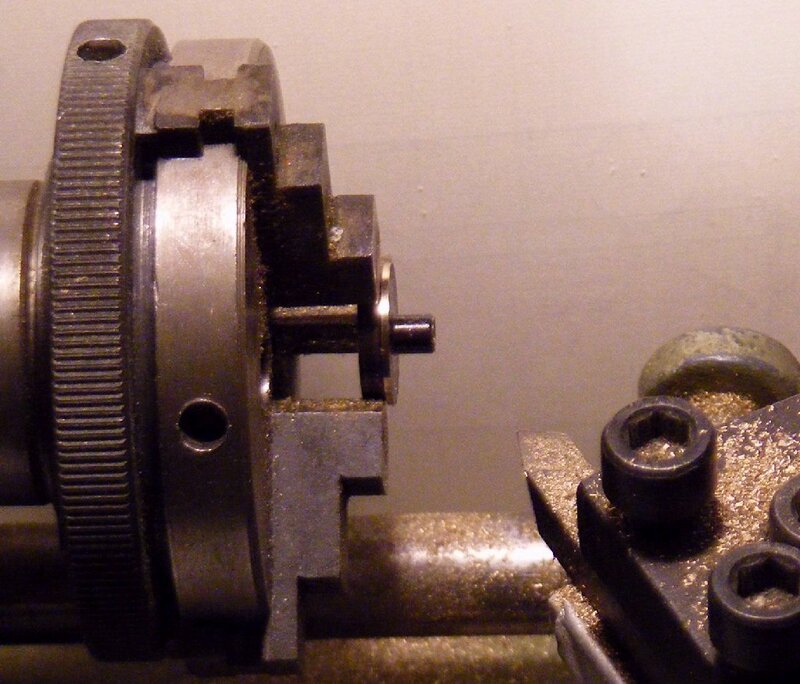 The first pic shows the clearance available over the gearbox for the 14 mm wheelset at 12.7 mm back to back. (The first pair of wheels have no axle). 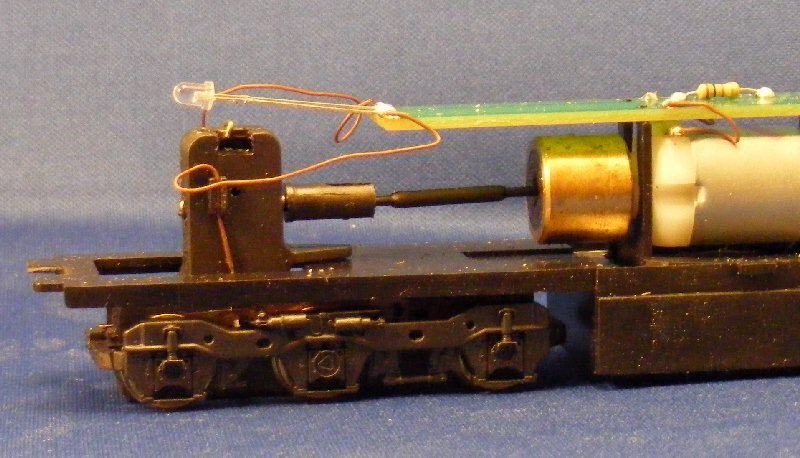 The second pic shows the turned wheelset and one made up with the unaltered wheels at original back to back, sitting on a 14mm gauge turnout. 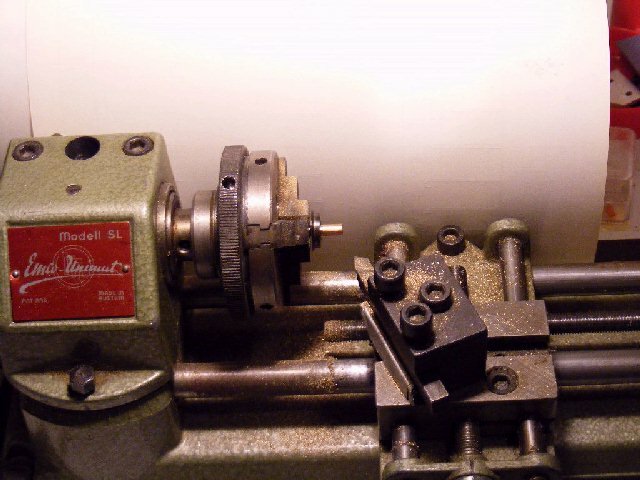 First thing is to set the lathe up. 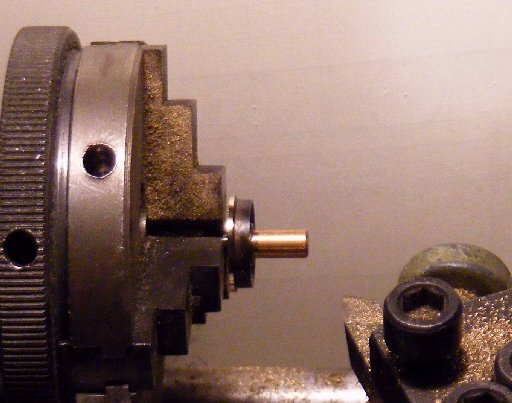 As the wheels have hollow stub axles with rather a thin tube i first turned up a plug to fit closely within the bore to support the axle when holding in the chuck, the first wheel is then chucked by the stub axle for step one, reducing the flange depth. The pictures show before and after. 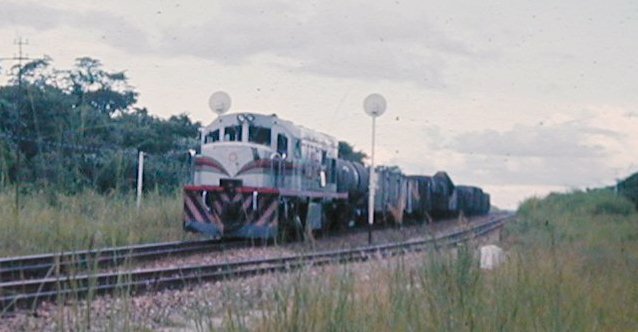 All steps are repeated for the 10 remaining wheels. For step 2 the wheel has to be reversed in the chuck to reduce the flange width by facing off the back face of the wheel, again before and after pictures. 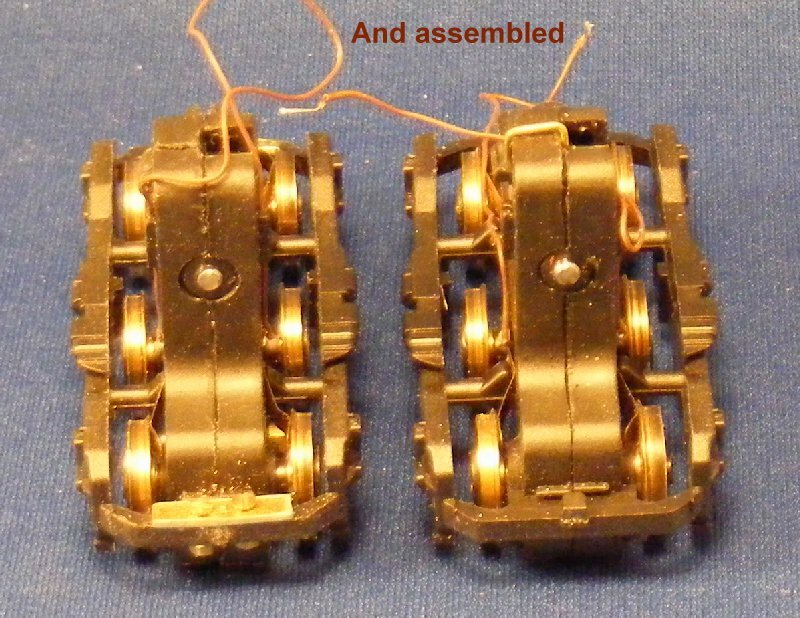 Here step 2 is completed for all 10 wheels, also shown is the plug used to support the stub axle and the first wheelset completed as a trial run. 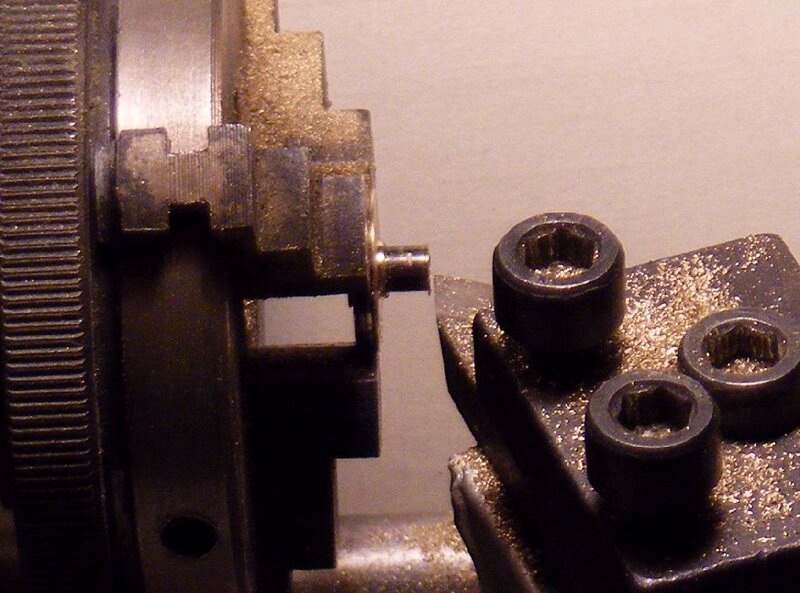 Step 3 is to bring the overall wheel width down to scale by turning 0.5mm off the front face. 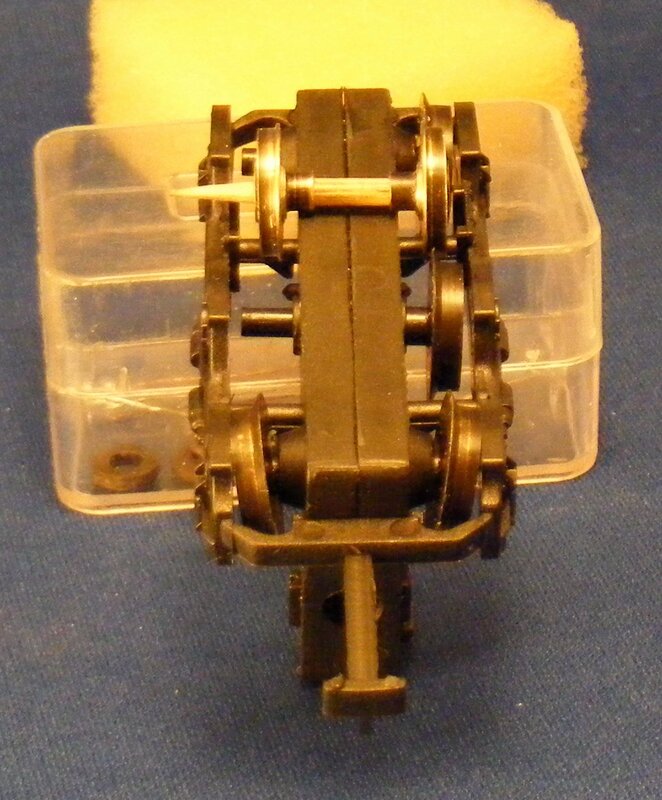 For this the wheels are held on the stub axles again. 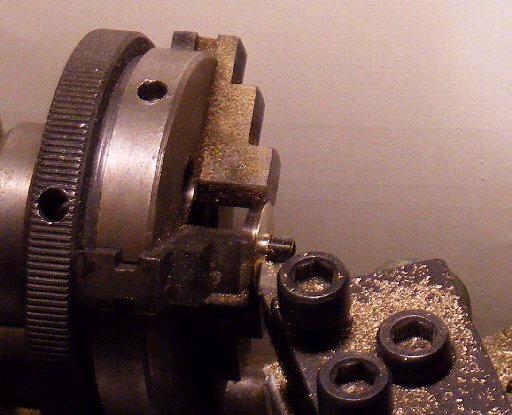 These steps leave a square cornered flange that just needs smoothing and rounding off a little, to do this I use a needle file gently and carefully. Its not possible to access the flange with the file with the wheel in the 3 jaw chuck so it is swopped for the drill chuck to carry out this action. 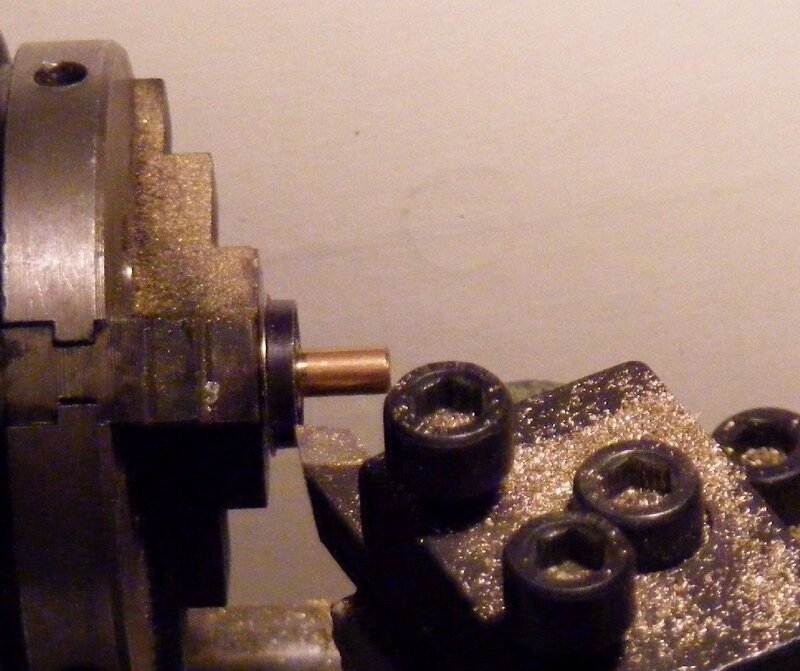 Step 5 is the finish, to shorten the stub axle so that I will get the correct back to back when the wheels are refitted to the geared axles. 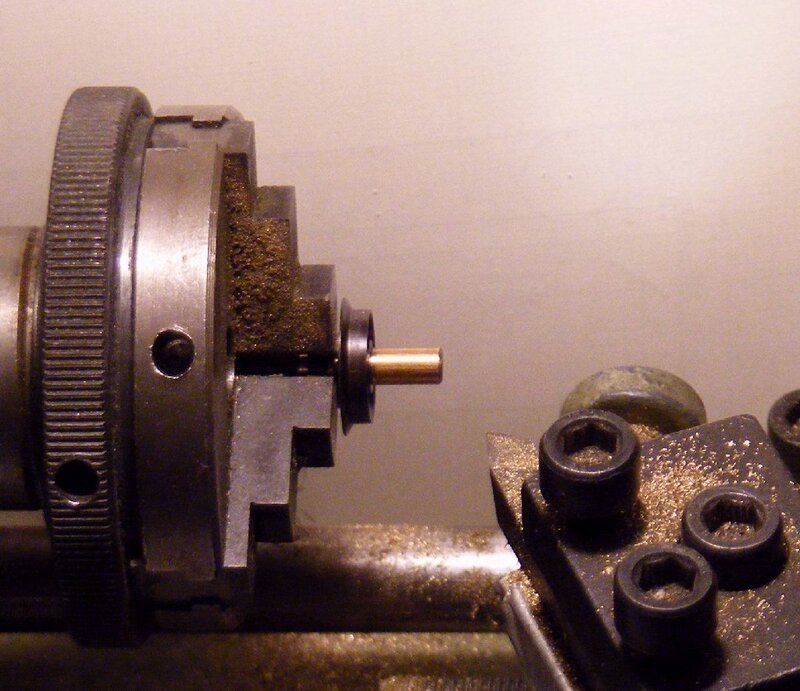 I needed to reduce it to be 3mm from the back of the wheel. Just over 1mm to remove. A file was used to deburr the end after turning. So, after the second session I have 12 wheels ready to reassemble. The primary task on the gearbox is to thin down the bearing bosses for the outer wheelsets so that the overall width is 11mm, or 5.5mm for each half of the box. This means taking 1mm off each side. At first I tried filing them down, even with a fairly coarse file this was hard work, the slippery plastic does not like being filed. When I got to the second half of the box, which has the internal gear axles protruding, it was clear that the filing technique risked damaging the axles. Having second thoughts I fitted a new blade to my scalpel and tried slicing the plastic off, this turned out to be easy and much quicker and was used for the remaining 3 half boxes. 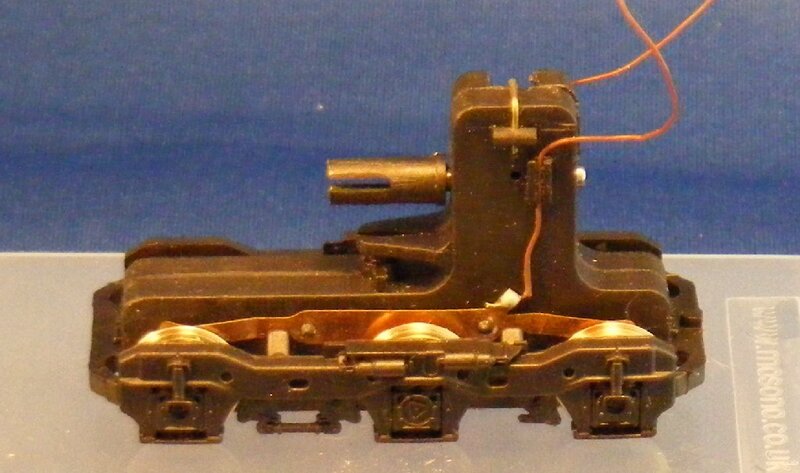 With that done all that remained was to re-assemble, removing the bogie mounted couplers in the process. 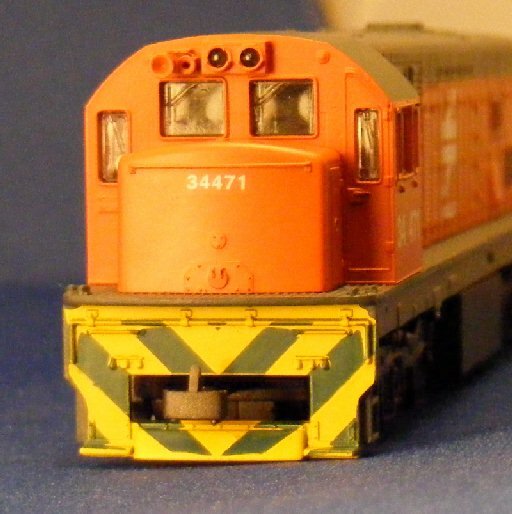 Fitting the pickups was a novel experience, usually when rewheeling 00 locos to P4 its a struggle to bend the pickups out to reach, here the bend had to be reduced to fit them in the narrower gap behind the wheels. 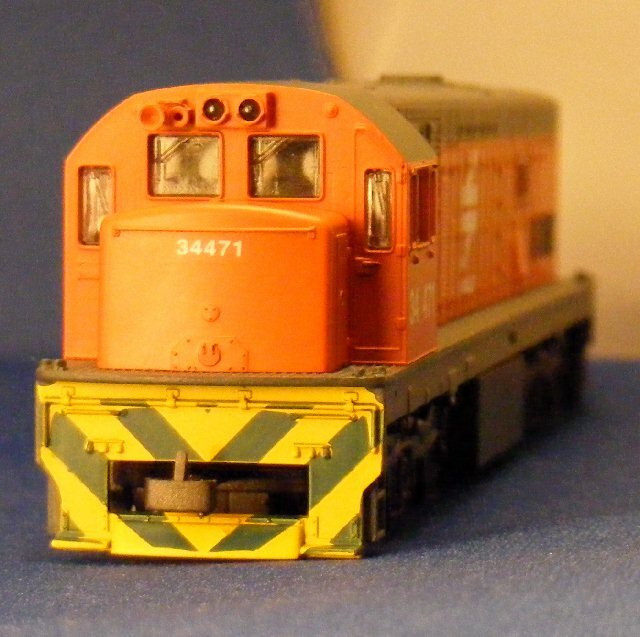 If experience shows it to be needed it will be simple to add another wiper for the centre axle. The bogie was refitted to the frame before repeating all these steps for the other bogie. With the body on its ready to start the cosmetic work, apart from painting the main issues are the couplers and pilots, and relocate the horns. But at least its now running on the correct track gauge as can be seen here. 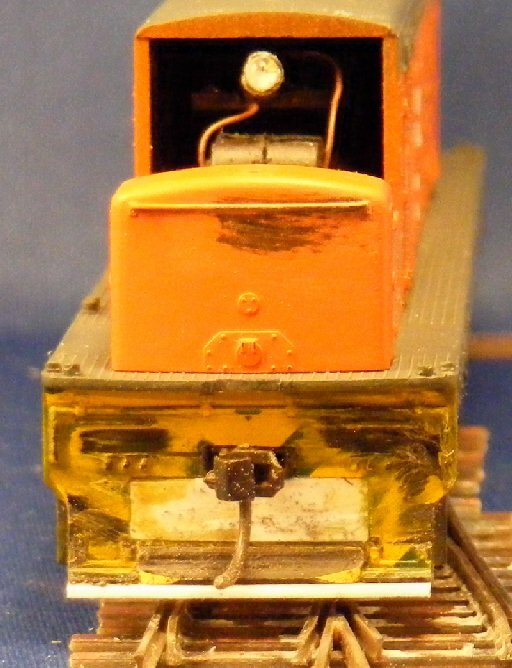 At this time I have not made any attempt to reduce the overall bogie width, the outside frame holds the gearbox together and any change would have to be carefully thought through. 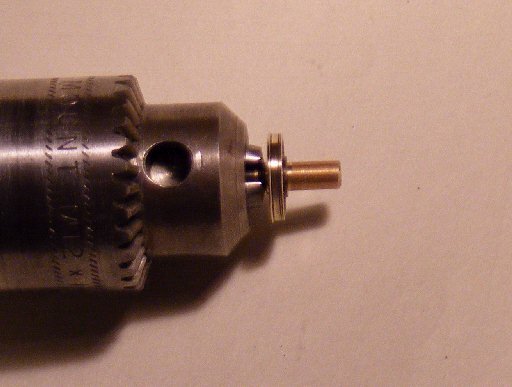 The axlebox centres as shown in the drawing above are 64" so the width over axlebox ends should be close to 76", or just over 25mm to scale. The frame actually measures 27.5 so making the change would be worthwhile and will go on the 'think about it' list. also the ZR pilot has a different style at the bottom edge. 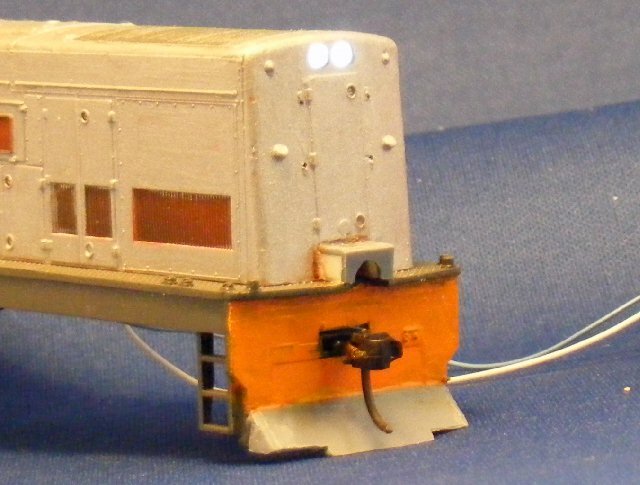 First item was to establish the coupler height. 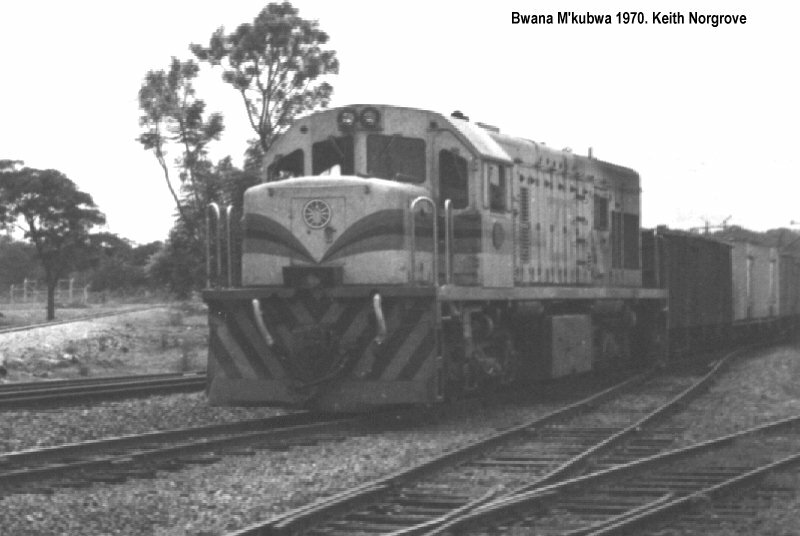 Reference to the drawings shows that the couplers have a centre height 2' 11" above rail, while the footplate is at 4' 10". 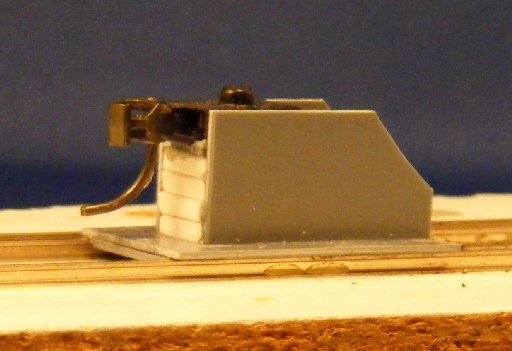 After verifying that the footplate height was correct and checked the depth of a Kadee coupler box the height for the top of the coupler box was marked on the pilots. 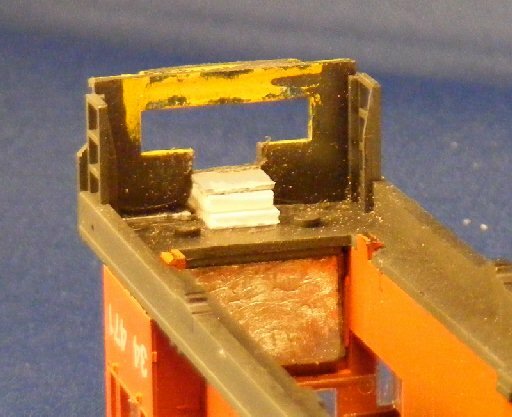 Conveniently this put the bottom of the coupler box in line with the top of the existing hole, which meant that simple rectangular plasticard fillers could be used. Before continueing two preparatory actions were taken, first the chassis ends were notched to allow space for the body mounted coupler pads. These notches can be identical at each end. 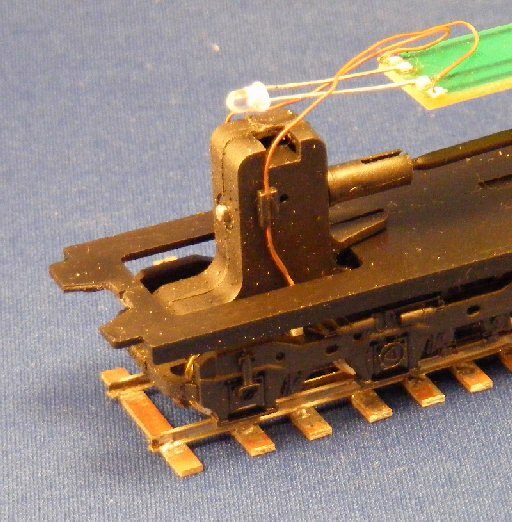 Next a coupler height gauge for the Kadee couplers was made up, a simple construction in plasticard with a Kadee 5 fitted, the standard Kadee gauge cannot be used as it will not fit the gauge and the coupler height is set to 3.5mm scale not 4mm scale. 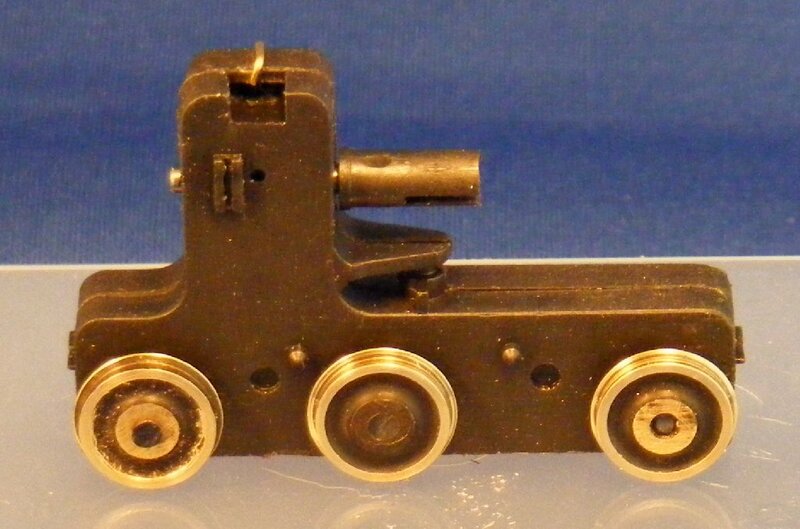 Now we can get on with fitting the couplers and filling the pilots. First I build up a coupler pad from layers of plasticard at the back of each pilot. 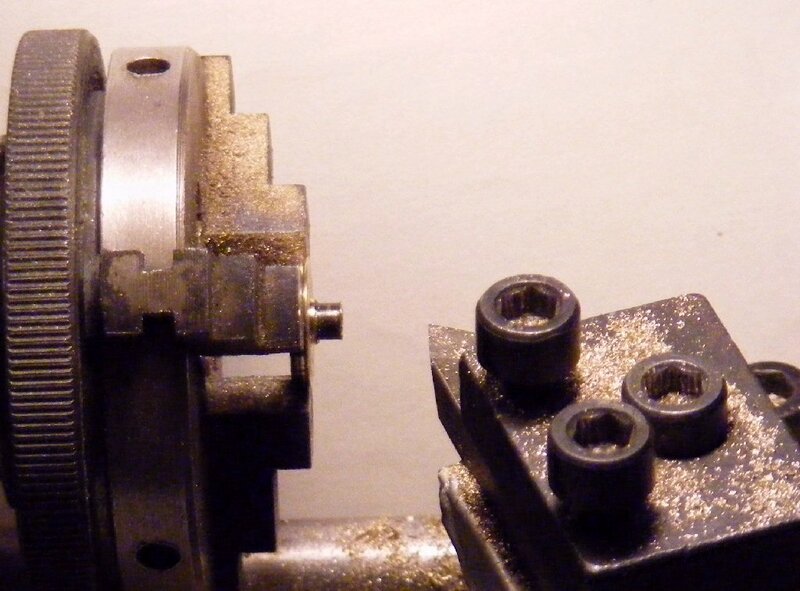 Then with the pad in place the slots for the coupler pockets are cut and filed to a neat fit on the coupler boxes. 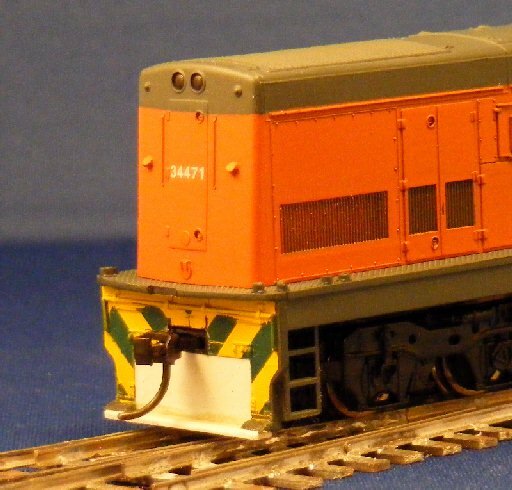 I used No.6 couplers for this as the boxes are short hence did not need an excessive notch in the chassis ends. 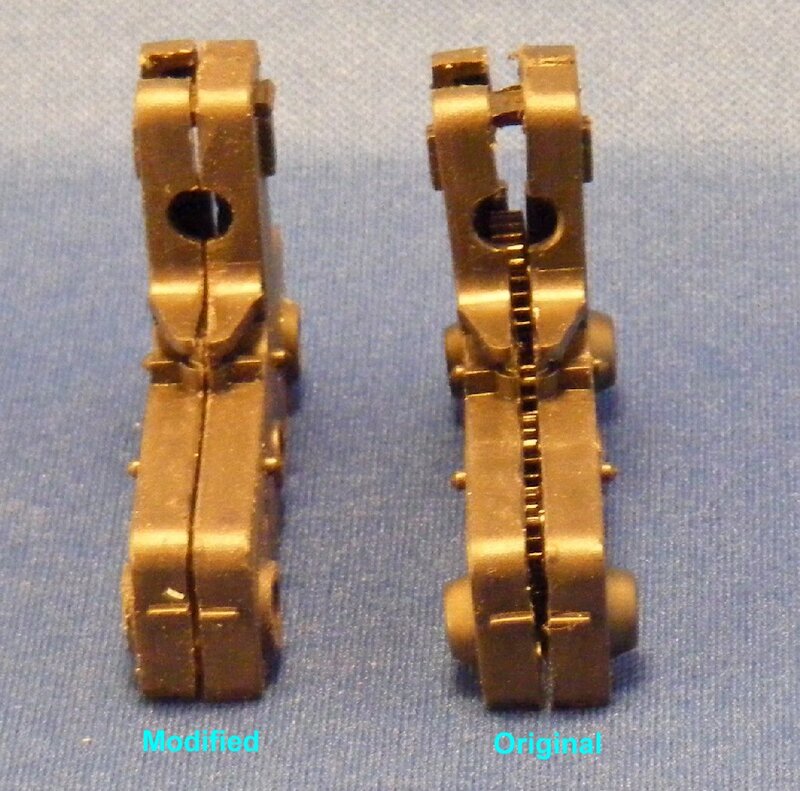 The coupler pads are allowed to dry out then drilled and tapped to fit the couplers. I use Kadee taps and nylon screws. 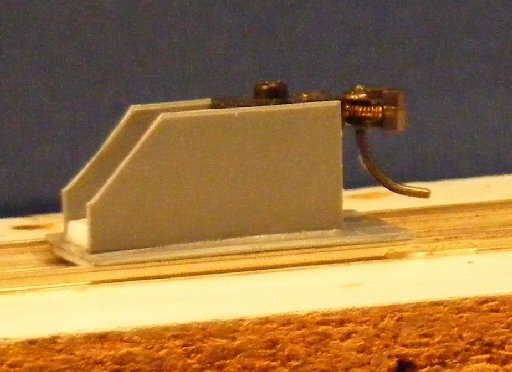 With the couplers in place plasticard rectangles are cut tofill the remaining holes in the pilot and a narrow strip filled horizontally at the base to reduce the rail clearance and provide a base for the sloping section at the bottom of the pilot. 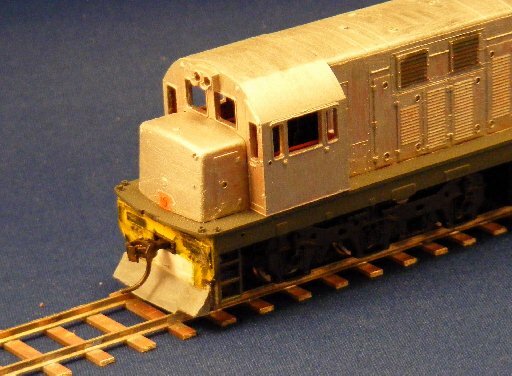 The existing central section on the front pilot needs to be filed back ready for future fitting of this sloping section which is full width on the ZR locos. NB. 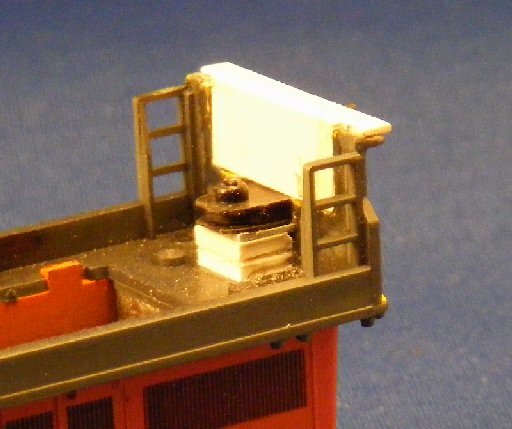 during a spare moment at this time I unclipped the cab to check that the glazing can be removed for painting. No problem, its a simple clip fit. Finally the couplers are checked for height. 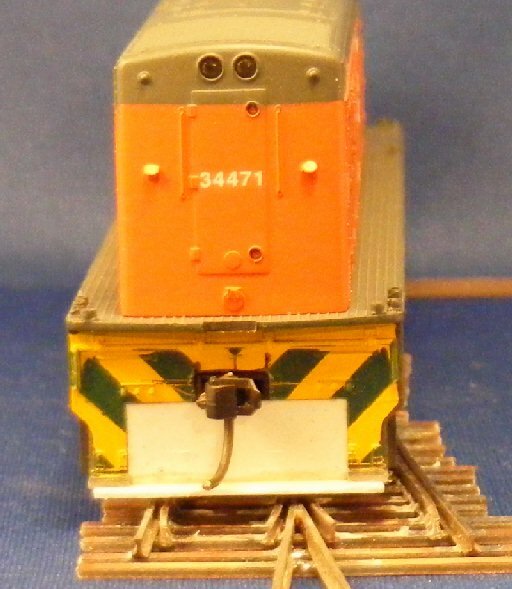 OK after a slight excursion to assemble a bit more track so I have something appropriate to stand it on. The next step was to complete the lower section of the pilots. 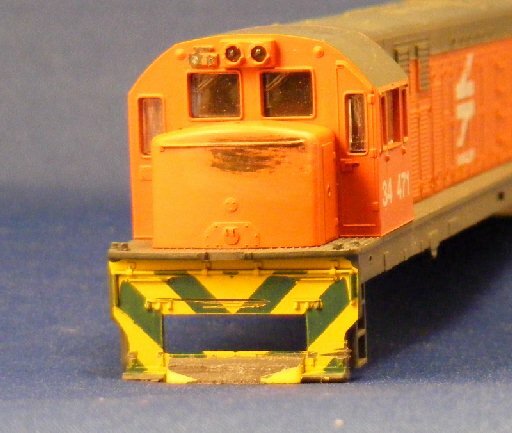 Also I have made a start on hiding that South African orange paint. 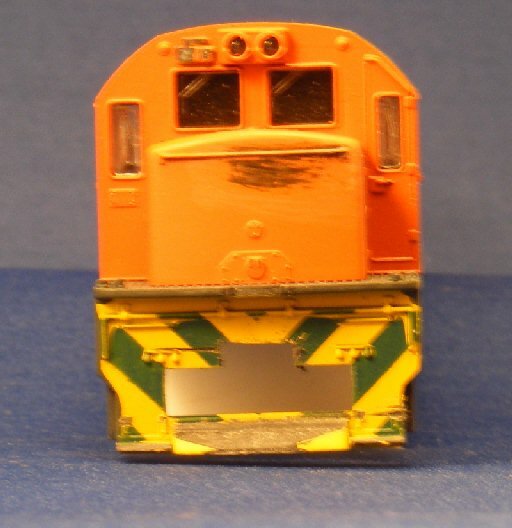 Paint doesn't look to good on the nose so will need a rub down before the next coat. October 26th. Recovered a bit of time and enthusiasm and started on the lights. 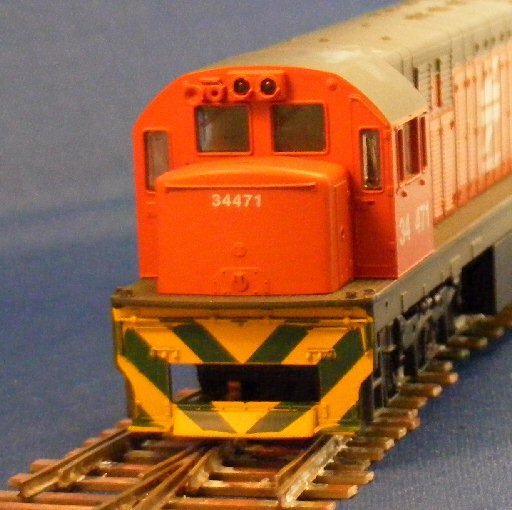 The headlights have an LED waving in the air behind them which is a bit hit and miss as to how much of its output reaches the light pipes, and at the cab end a lot of this light fills the cab. The tail lights are just moulded on, so also need to be considered. 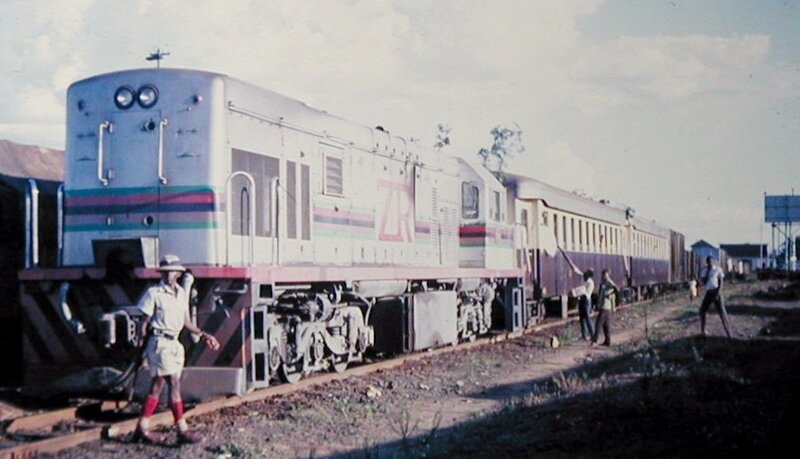 My memory of these locos is that headlights were always lit when running but I don't have any recollection of ever seeing the tail lights in use although the lenses do show red. So my aim is to improve the headlights and just represent the tail lights by painting the lenses red. 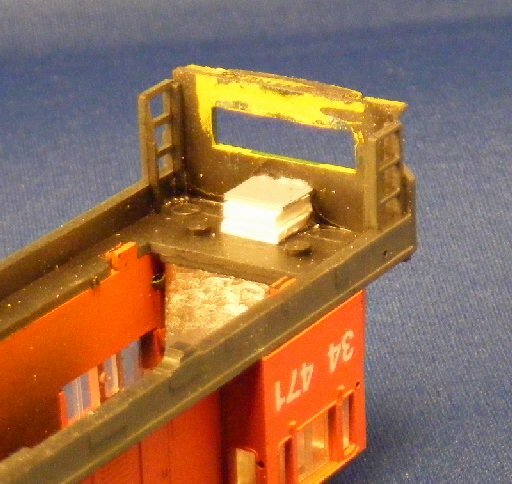 This will allow use of a decoder with just the stadard front and rear lamp functions. To get an LED close up behind each light pipe for the twin sealed beam headlamps I will use a pair of surface mount LEDs at each end. 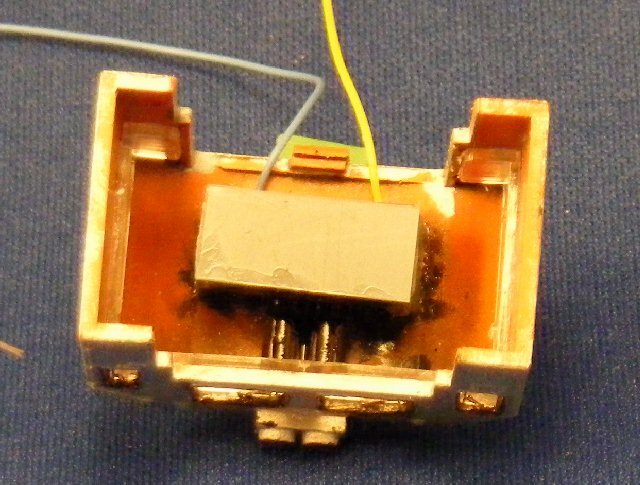 The spacing required allows these to be assembled on a small piece of stripboard with a 560 Ohm resistor in series. 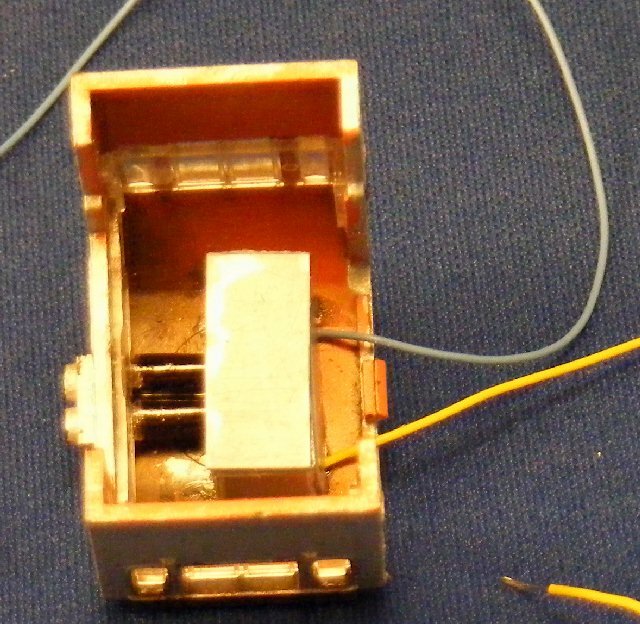 The two LED assemblies were built and tested with the decoder before boxing them in behind the light pipes. 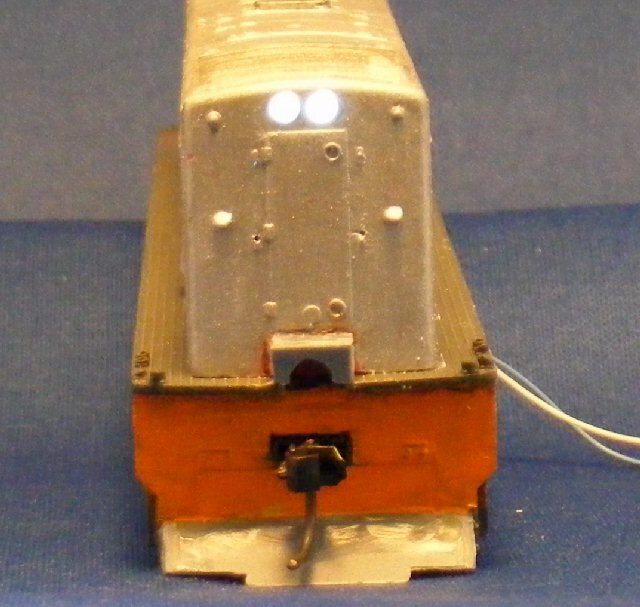 This shows the LEDs series connected with spacing to match the headlight/windscreen moulding. And below the PCB trimmed to size ready to fit. Two of these light boards were assembled. 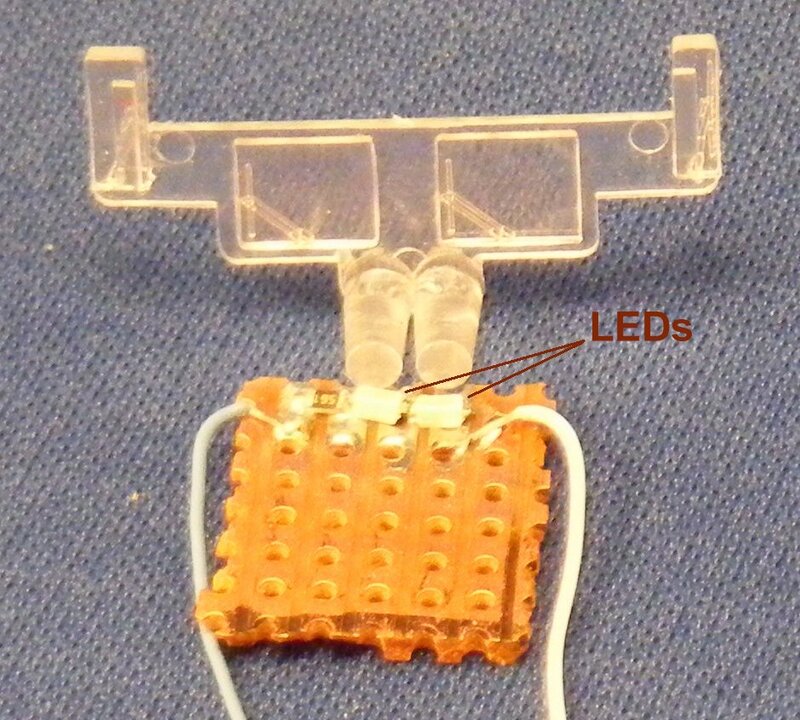 Here the first light unit has been held in place with a bit of bluetack then boxed in with two strips of styrene. 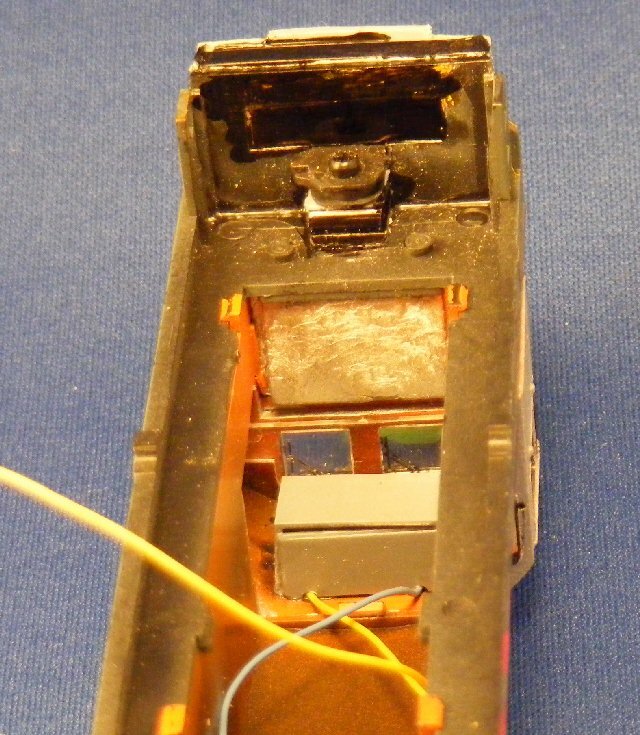 The result when powered up, note the start made fitting the MU cable cover as well. 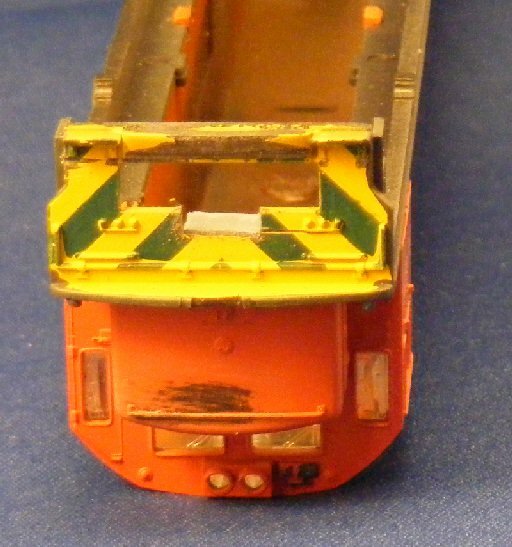 Boxing in the other LED assembly in the cab roof involved a bit more work including some black paint on the light pipes to minimise spillage into the cab, a bit still leaks out but it looks worse in the photos than for real. 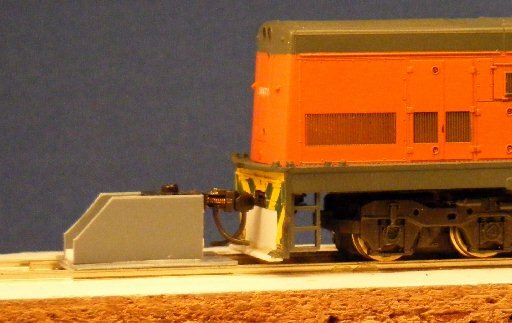 Thhe loose cab above then fitted to the body below. With both sets of lights in place its time to fit the decoder and assemble everything. 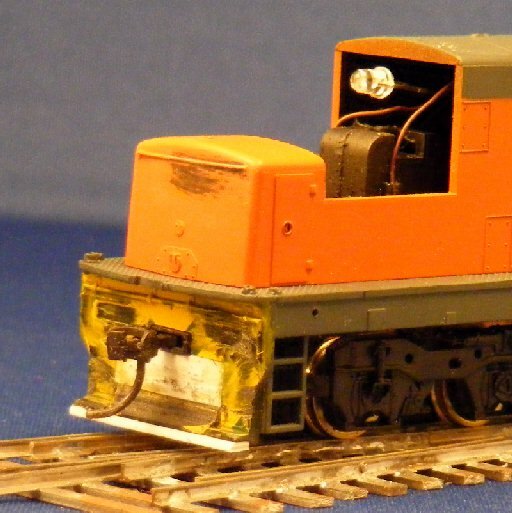 However while its in bits I decided to complete the work on narrow gauging the bogies by reducing the frame width to the prototype dimension as discussed above. 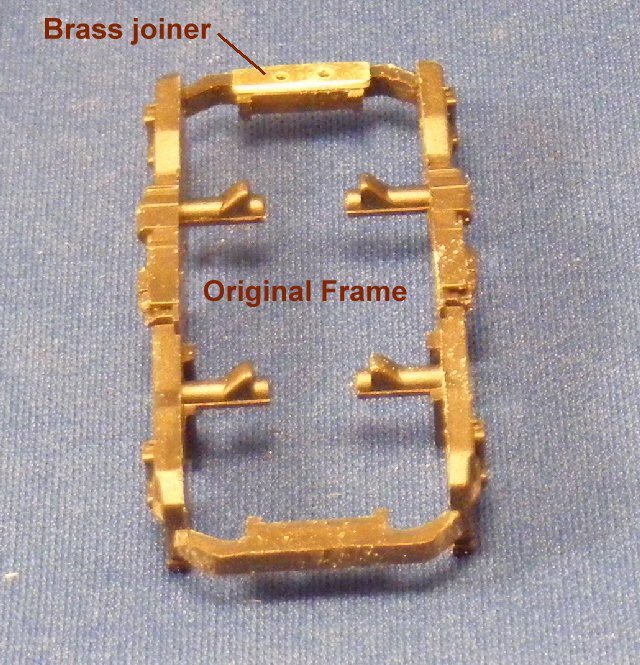 The one piece bogie frames are held in place by two pins each side that clip into recesses in the gearbox sides, small fillets on top of these pins hold the current pick ups in place. 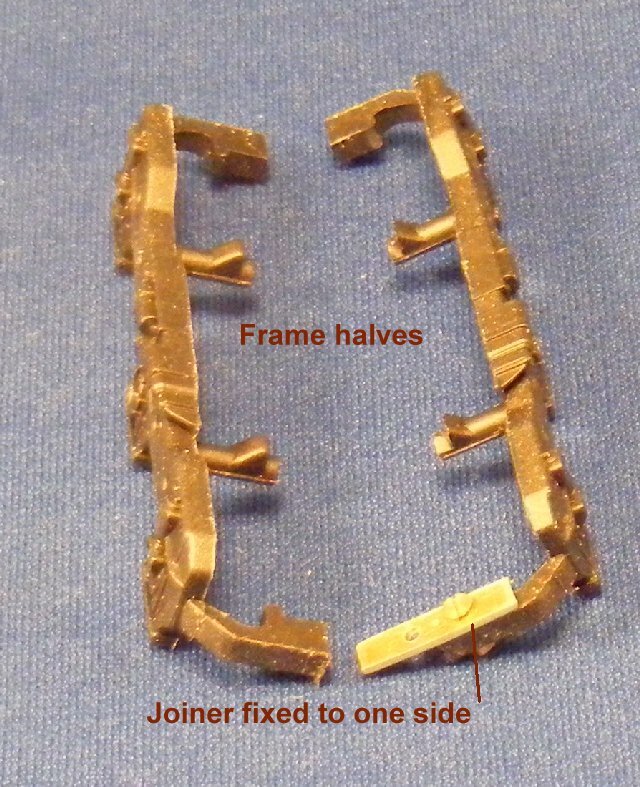 The frames need to be narrowed by 2.5mm so each of the 4 pins needs to be shortened by 1.25 mm, the retaining fillets similarly cut back and 2.5mm removed from each frame end transom. Luckily there is enough meat in these transoms to rejoin them with a brass joiner bolted in place with 12BA bolts. 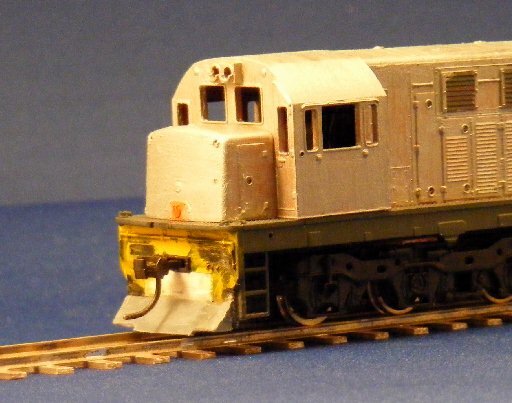 Then it just remains to do the same to the second one and re-assemble the loco. 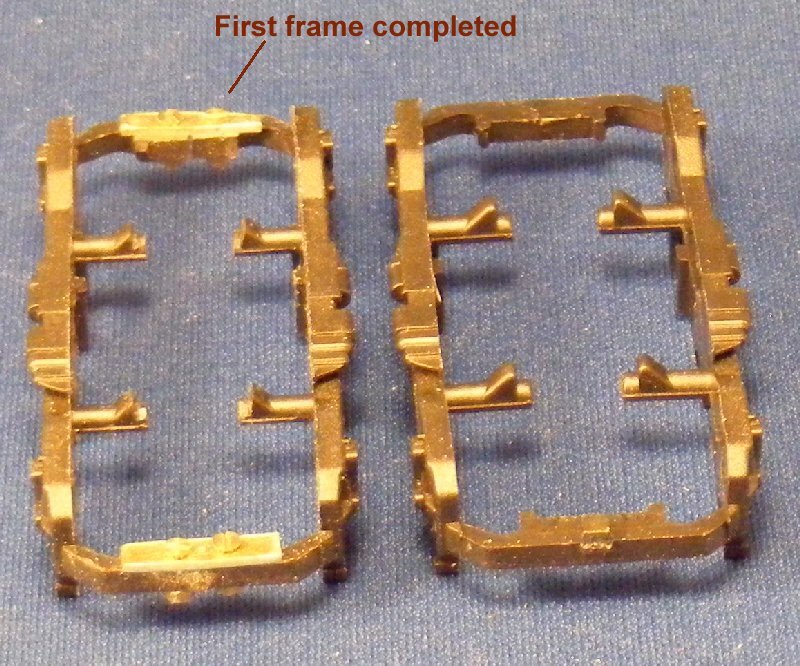 The following pictures show the various stages in creating plasticard supports for the decoder. First a new motor top plate instead of the original circuit board. Then a support for the speaker. 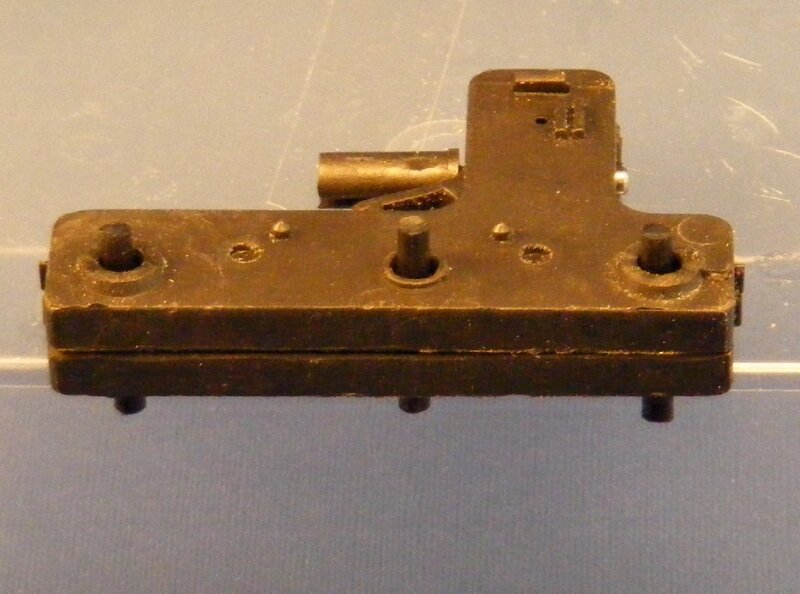 and a support for the decoder. 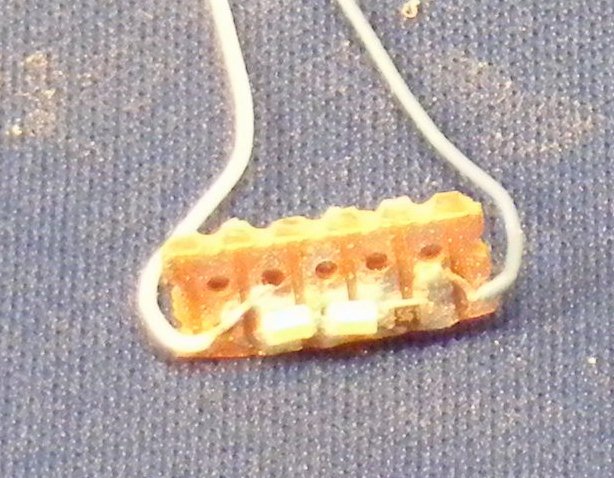 A couple of bits of stripboard to join the pickup wires. 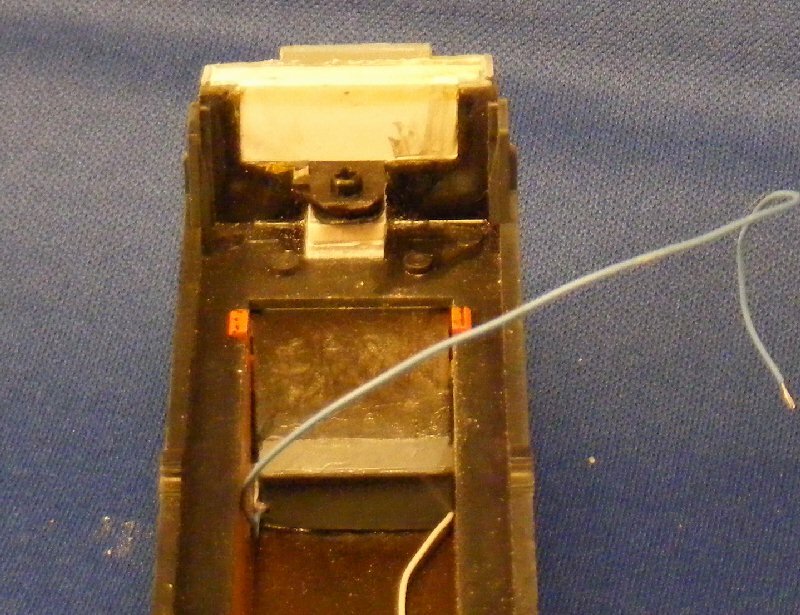 Then connect all the wires, including those from the lights ready to clip the body back on. 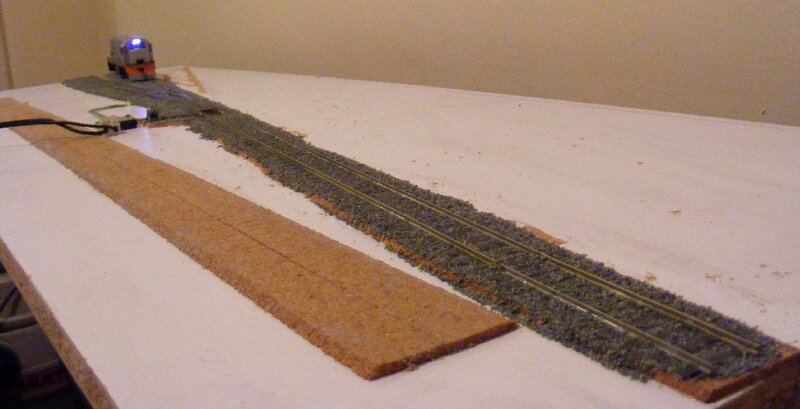 At this point I took time out to lay the track on a test board, replacing the track on a board previously used for a P87 demo. 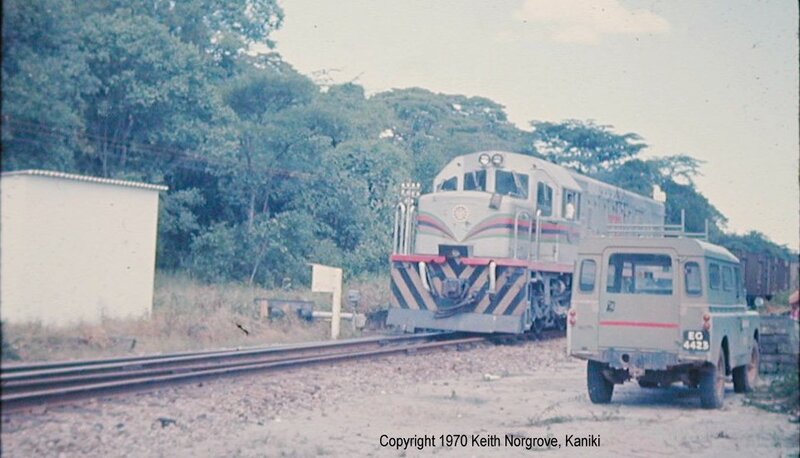 Just the one turnout and three lengths of track to allow for shunting up and down. 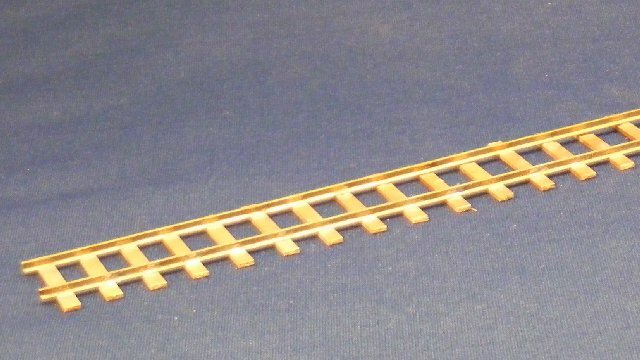 The track was laid by my usual technique, glueing track and ballast in one operation. See 'Shed relay' here for details.